These tea biscuits have a nice shape, shortbread texture and typical aroma of homemade cakes, and they make a perfect combination with their cocoa coating. 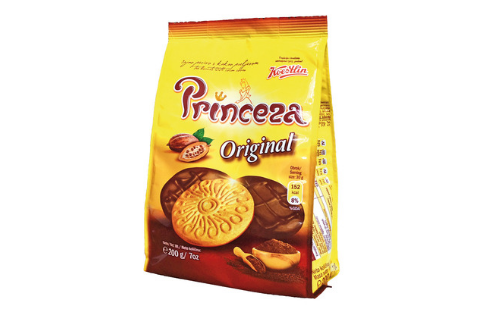 Princeza Original: WHEAT flour, cocoa cover 23% (sugar, partly hydrogenated soya fat, fat reduced cocoa powder 5%, emulsifiers: SOYA lecithin, poliglicerol poliricinoleat), palm fat, sugar, starch, powdered whey (from MILK), raising agents: ammonium carbonates, sodium carbonates; salt, acidity regulator diphosphates, flavours. 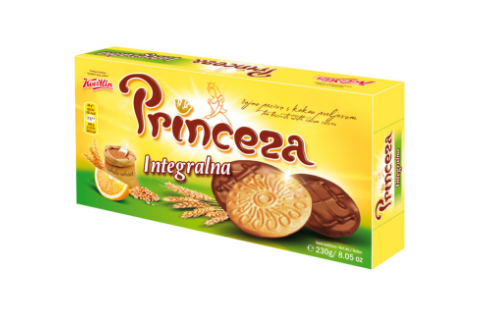 May contain peanuts and other nuts.